Los Montesinos is close to the motorway meaning that it has quick and easy access to the surrounding cities of Elche, Alicante and Murcia. The town is a two hour plane ride from most U.K. airports. If you would like to go on holiday to Los Montesinos then you can choose either Murcia or Alicante as your flight destinations. Murcia and Alicante are serviced by quite a few budget airlines including Ryan Air, Monarch and Easyjet. Both airports are within thirty minutes travelling time to Montesinos. To get directions to Los Montesinos see our dedicated Los Montesinos map page. Once at the airport you have a range of different airport transfer options to Los Montesinos including private shuttle buses, taxis or Los Montesinos car hire (see below). 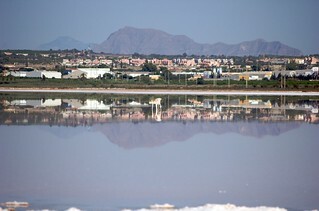 Los Montesinos is right next to the giant salt lakes (see picture) of Torrevieja known as Laguna Salada de Torrevieja and Laguna Salada de la Mata, this makes for a really healthy climate. The nearby nature reserves and their lakes are perfect for bird watching, walking, cycling and horse riding. There is a lovely square in Los Montesinos boasting several bars and restaurants, serving international English and Spanish cuisine to enjoy your Menu del Dia or go out for a drink. Torremendo is a mountain lake nearby where you can swim and fish. Los Montesinos also has a bowling club and a market every Friday offering everything from fresh fruit and vegetables to flowers and leather goods. There are plenty of villas and apartments available for rent whether on a short-term holiday let basis or even a long-term rental of 6 months or a year. The excellent climate and consistent temperatures are one of the major reasons people visit Los Montesinos at all months of the year. Below we show you the current temperatures as well as the weather today in Los Montesinos. You can get more detailed weather information by clicking the links. This gives you conditions i.e. sun, cloud, rain, overcast, clear, etc as well as the humidity, pressure, wind direction and wind gust strength. You can see a long-range weather forecast giving a 5 day, 7 day (week forecast), 14 day, 15 day and 10 day forecast for Los Montesinos weather. There are several golf courses and good beaches in the area. The closest beach is that of Guardamar, a ten minute drive away from Los Montesinos. Also worth a visit are Torrevieja beaches and La Zenia beaches. Day of Segregation in July. Virgen de Pilar in October. Day of Saint Cecilia in November. See the video below to see actual footage taken from the fiestas. The nearest golf course to Los Montesinos is “La Finca” five minutes away by car which is considered to be one of the best on the southern Costa Blanca. There are also golf courses at Campoamor and Villamartin. Many expats have made Los Montesinos their home and it is considered to be a warm, welcoming and friendly town. Within drivable distance of Los Montesinos is a water park called Aquapolis. Not far from Los Montesinos is the large beach town and resort of Torrevieja with a very good market every Friday. 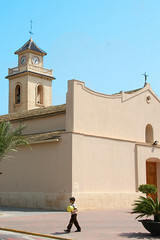 Torrevieja is also known for its superb promenade, restaurants and the Habaneras shopping centre. There are a number of historic cities within an hour’s drive of Los Montesinos – Murcia, Cartagena, Orihuela, Elche and Alicante. Try the market on Wednesdays in the small inland town of San Miguel de Salinas which is not far (head towards Villamartin). Although there isn’t an official tourist information office in Los Montesinos, you can find one either in Torrevieja or San Miguel de Salinas. Los Montesinos is a popular area for expats to move to, especially if you are retired. You are away from the busy coast which is overun by tourists in the summer yet you are just a few minutes drive to the beaches whenever you choose. There are more golf courses in this area than the Northern Costa Blanca and you are much closer to the major airports of both Murcia and Alicante so that is handy is you use your property as a second-home for some much needed sunshine. If you are looking to move to Spain to really feel like you are living in Spain then Los Montesinos is not your best choice. This is very much a melting pot of different nationalities and is not your typical Spanish town. Have you moved to Los Montesinos? We would love to hear from you about your experiences and whether you would recommend it to others. We also welcome employers listing any job vacancies in Los Montesinos below using our comments box. We have a property just outside a village called Los Montesinos which is a few kilometres inland from Torrevieja on the Costa Blanca. There are lots of expats who have settled here and really enjoy the laidback lifestyle the area has to offer. Not being a tourist area, more a residential area prices of meals, drinks, and general shopping are very reasonable. The price comparison search engine below finds the cheapest car hire deals for Los Montesinos. Giving you the lowest and cheapest price for renting a car in Los Montesinos. Los Montesinos is a very small town a short distance from the coast (and beaches) and the best option is for you to immediately hire a car for the duration of your stay from either Alicante airport or Murcia airport. Alternatively get an airport transfer by either taxi, mini-bus or private shuttle bus to Los Montesinos and stay in your resort and get taxis when you want to get out and about. To get a taxi from Alicante airport to Los Montesinos costs approximately €65. The nearest car hire company we know of is Coys Rent-a-Car in nearby Torrevieja. Page Summary – Our guide covers useful Los Montesinos information for people coming to the area for a holiday, so we cover the important factors such as weather, where to go and what to see and do on your trip. We also consider whether Los Montesinos is a good town to move to and find work. There is a bus every weekday morning at 9.15 going to the hospital where you can change to a bus into Torrevieja centro. There is a bus every work day going into Torrevieja at 1.30.There is also a bus going into Torrevieja on a Friday at 9.30 for market day. And on Friday there is an extra bus returning at 12.30pm. The only bus back from Torrevieja, excepting Friday when there are 2 returns, leaves the bus station at 3.30 every work day. The reason for this dismal bus service is, we are told, that not enough people use it.